If you ask any Member of Fellowship Bible Baptist Church who was the “First Man” on earth, the answer would be without a doubt: “Adam.” If you ask the same members who was the “First Man” to join Fellowship Bible Baptist Church, there would be more misses than correct answers. FBBC Spotlight this month focuses on Our First Adam, Deacon James E. Spyies. He was born on August 2, 1938 in Leesburg, Florida, and is married to Gladine (Hunter) Spyies (for 38 years). He believes each year gets sweeter and sweeter. Brother Spyies is the father of a son, Carlos, and two daughters, Brandi and Jimmille. The Spyies’ Family also own the title as “the First FBBC Family” to join Fellowship over 35 years ago. His hobbies and interests are-fishing and traveling with family. James E. Spyies retired from the USAF after 20 years of distinguished service. During his career in the military, he spent several years overseas; with two tours of Duty in Vietnam. He stated that life in the military gave him many opportunities that he would not have experienced. It taught him to be disciplined and it also prepared him for his future career after military life. After his military career, he worked with the Georgia Department of Corrections and retired as a Lt. of Corrections for The Georgia Department of Corrections. Brother Spyies has served FBBC for over 35 years. 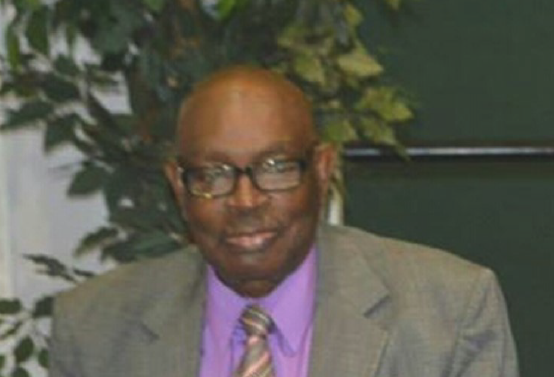 During this time, he served as Sunday School Teacher, Choir member, Board of Trustee, janitor, deacon and in any other capacity needed. I wanted to thank FBBC for honoring my father in the Senior Spotlight. Words can not express how proud I was to read such words on this humble man. Those who know my father understands that the term spotlight is so far removed from this character. He is a man that gave over what was asked and expected to the USAF and the Georgia Department of Corrections for many years. He continues to give above what he is asked in various capacities because he has a heart that serves. My father makes me proud to call him dad. For the almost 37 years of my life he has been a devoted father. He showed us protection, how to be dedicated to family, and how to go to church as a unit. One thing that I admire so much about my dad is how he and my mom work together as a team. While mom frequently flew to Washington, D.C. to take care of me while I battled advanced cancer in 2006, dad graciously stayed at home, updating those who were praying and fasting. I know it was hard for him to stay behind, but he will never really know the magnitude of his presence in that capacity. It reminded me of how they worked as a team when we were growing up. Though he and mom sometimes had alternating schedules, it wasn’t uncommon for dad to twist or braid our hair to make sure we looked decent for school and to be honest, he did a better job than mom. 🙂 Those very masculine hands have held military weapons, cooked food for the church, help brooms, mops and vacuum cleaners for the church, but what I am most proud of, is those hands grasping other’s hands to pray, to call or visit a person who is sick and shut in. He has shown me in my adult life how to encourage my husband, how to be attentive and how to take care of the elderly. To me my dad is a servant-leader. He is a role model for any young man because He always puts God first and family second. I can go on an on, but I will spare you :). Thank you for recognition, while he is present to appreciate it!